It is nearly six months since I arrived in Tasmania. The intense and challenging voyaging season is over. The sea-sickness is but a memory, with people suddenly coming out of the woodwork assuring me that Winde in particular sends her passengers to the rail more than other ships. I am rested, encouraged, just home-sick enough, and I have a job! If you’ve been keeping up, you might remember a few posts ago, I wrote about my top choices for employment this fall. The Isaac Evans, Sultana and Clearwater were tied for first place, and I was recently hired as Bosun on the Sloop Clearwater for the fall season! I’m really excited to be sailing on Clearwater, for many reasons. The first is its environmental mission. The Clearwater Organization was started in the mid-sixties by American folk-singer Pete Seeger in order to build environmental awareness about the Hudson River, which at the time was very polluted. 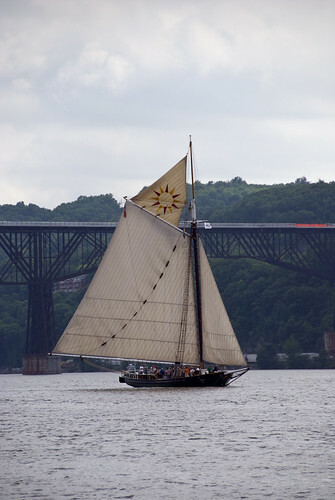 The sloop was launched in ’69 as a symbol of environmental stewardship and teaching tool for young students. Clearwater continues its environmental mission today, with multi-faceted programming, not limited to the work done on the sloop. I was raised as an environmentalist, and I look forward to using my science degree to teach about something that is so important to me. The second is the music. As I said, Pete Seeger started the organization, and continues to be involved today. For the last six months I’ve barely picked up a guitar, and it’s the longest period I’ve spent without almost daily music practice. I’m really looking forward to joining a ship whose history is intertwined with music. The third is the Hudson River! So far I’ve sailed around the islands of Maine, some harbors in Massachusetts, the Eastern Pacific of Southern California, and now the Southern Ocean, but I have no inland experience! I’m looking forward to learning about inland rules of navigation, and putting everything I’ve learned in my Coxswain’s course to work. Finally, I’m excited about the rig. After a square-rigger and a bunch of schooners, three sails is sure to feel sparse, but every ship has her own secrets to share, and I’ll be glad to get to know a new rig. Sometimes the simplest things in life are the most enjoyable.